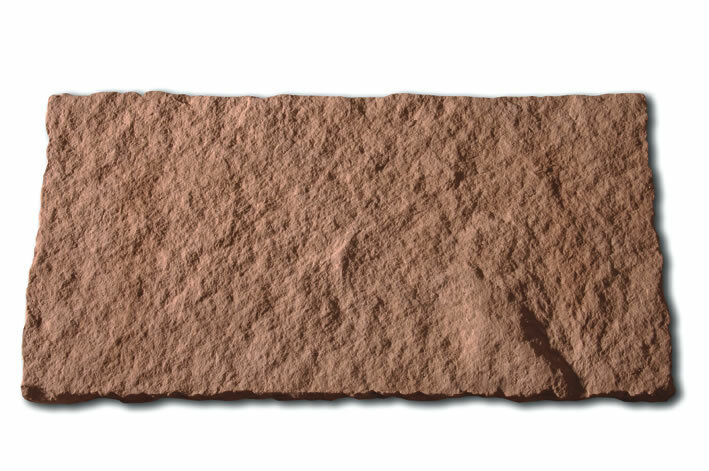 When you hear the word “paver” you may think its use is pretty self-explanatory. 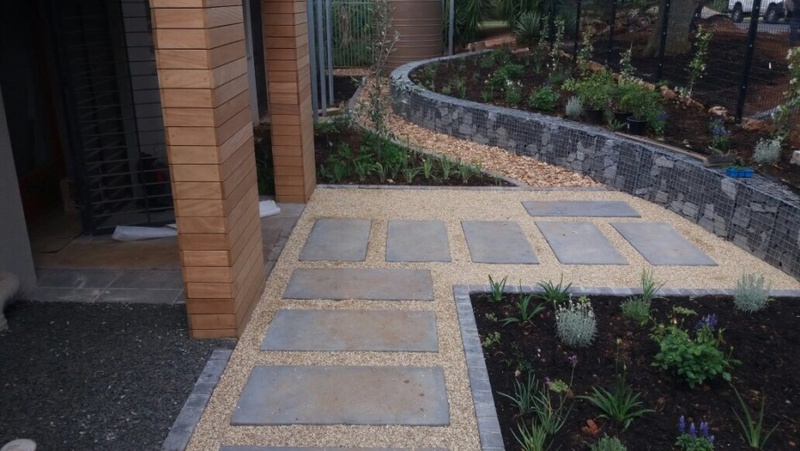 But really, a concrete paver can be used in a variety of ways around your home or in an outdoor area that needs a bit of a ‘sharp edge’ – excuse the pun. Pavers come in a variety of forms and are usually quite open to your interpretation, needs and wants as they can be cut to almost any form. 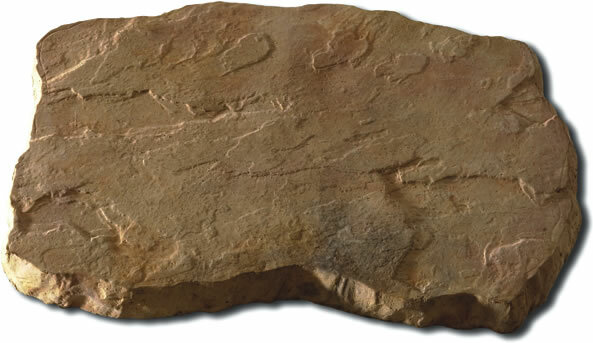 There is a wide range of landscaping applications where concrete pavers or paving stones make the perfect component. Soon you will be able to create anything you wish in your newly designed outdoor area. 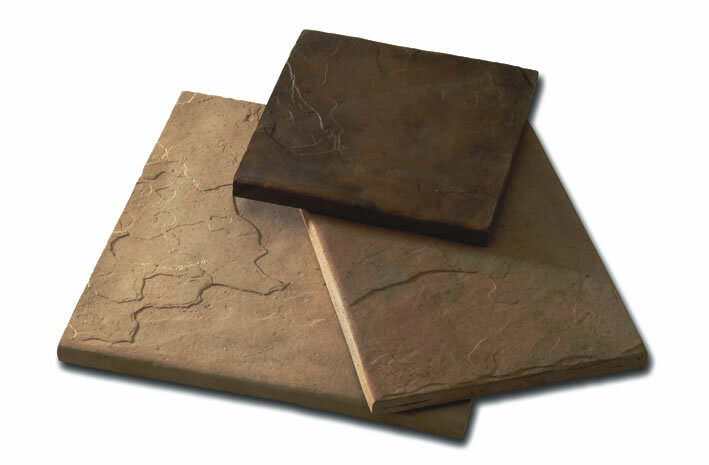 Trying to think of ways a concrete paver can be more than just a concrete paver? Keep reading to find out. Imagine showering as Adam and Eve did, in a foliage-filled sanctuary, surrounded by beautiful flowers, plants, and sounds. Perhaps you and the kids are having so much fun playing outside; you won’t want to track mud through the house. 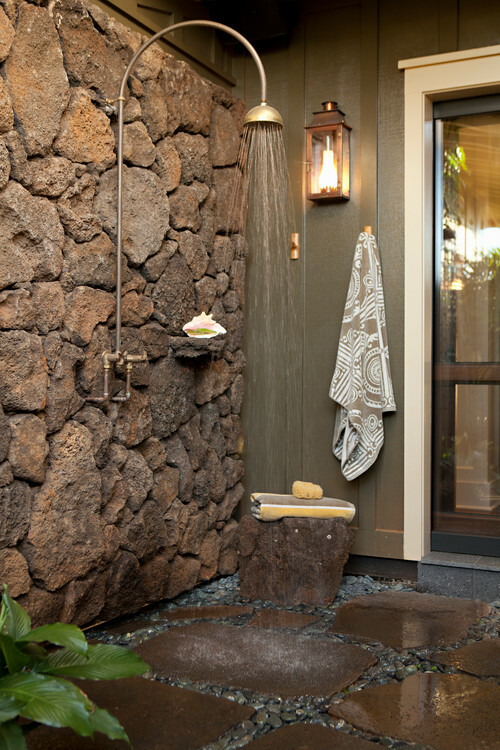 An outdoor shower can be the perfect solution. 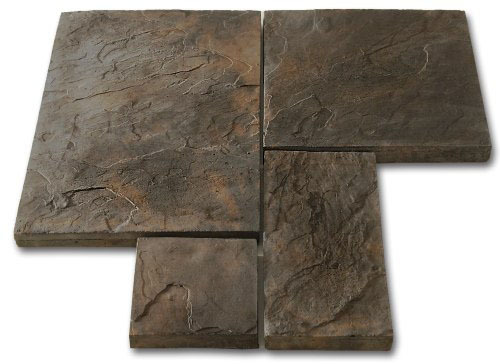 Concrete pavers are the perfect non-slip surface to lay on the base of the outdoor shower. 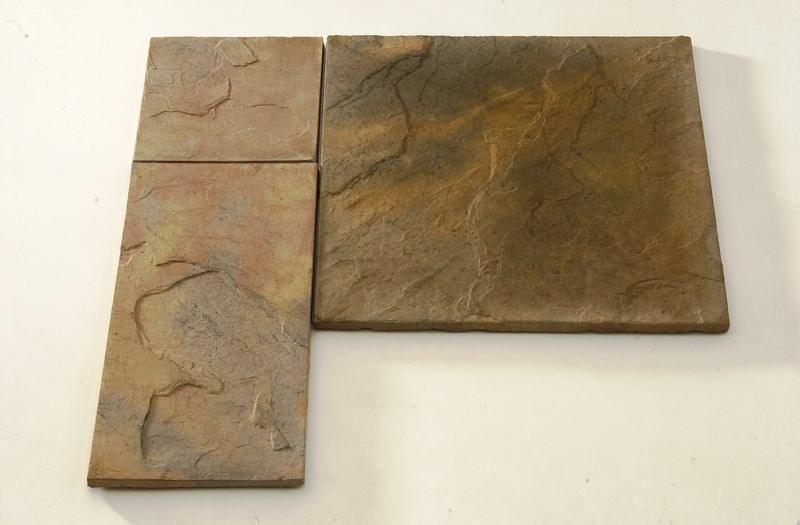 Additionally, you can use concrete pavers to form the outer sides or ‘catchment area’ of your shower. Remember, gravel has a tendency to travel and can be uncomfortable underfoot. 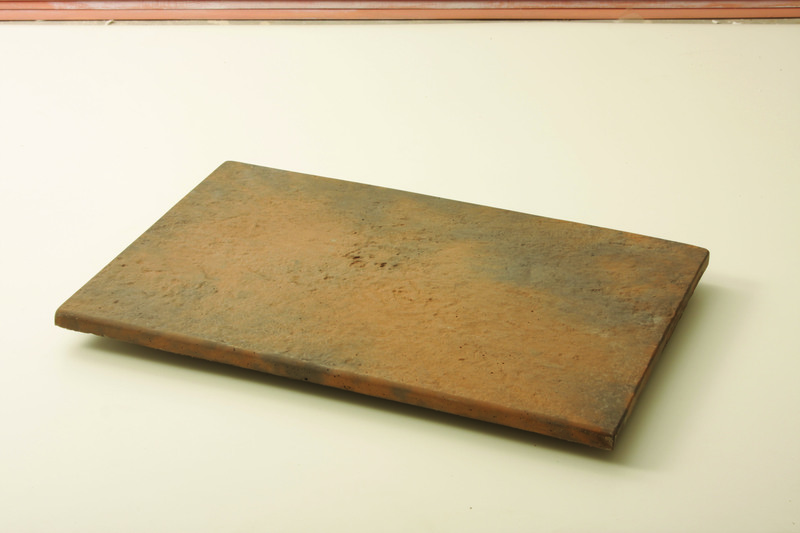 A concrete paver has a smoothed surface with a slight gradient to allow water to run off, which prevents slipping. 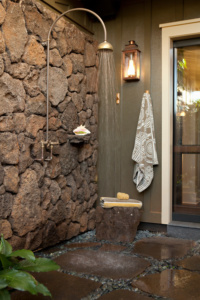 Setting up an outdoor shower may seem like a hassle, but in the end, it is so worth it. Why go on holiday when you can just wash your tresses while surveying your beautifully landscaped outdoor area. Create dimension in your garden or outdoor area with a raised garden using concrete pavers. A raised area can be great for planting small flowers, vegetables or herbs. 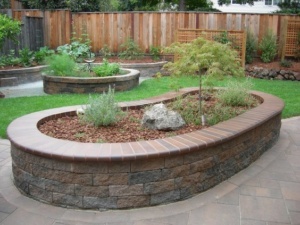 You can also create an attractive water feature that can be nestled at the top of the raised garden. Mini-waterfall, anyone? 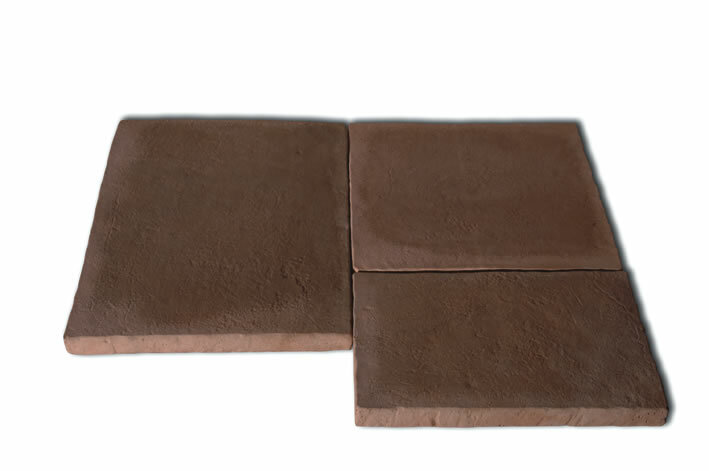 Start your raised garden by selecting four concrete pavers of your desired height. 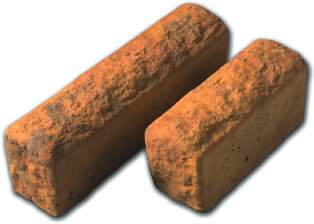 The size of your pavers will be determined by the total height you are hoping to achieve, i.e. how raised would you like the feature to be. 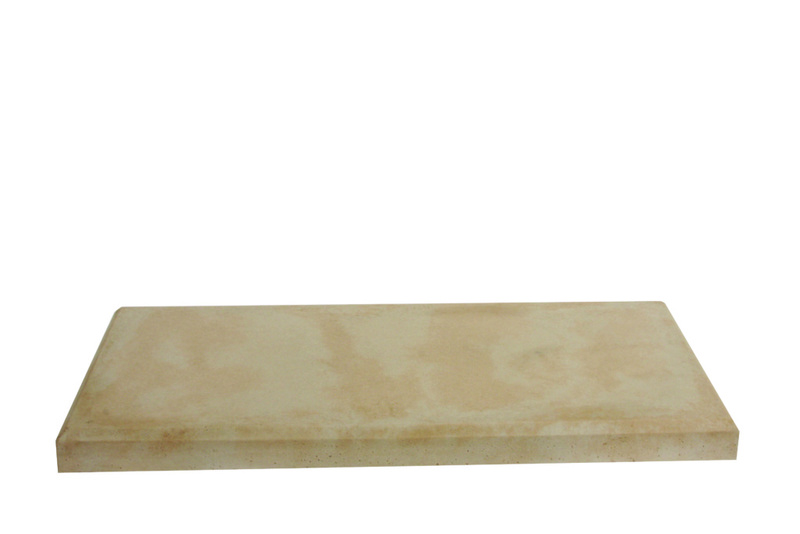 Add Klompie Brick Pavers to the top of the raised garden for a polished and finished look. A raised garden can also help prevent weeds and you can build an effective drainage system that is able to dissipate any unwanted water and moisture. This is a growing feature in many outdoor areas. 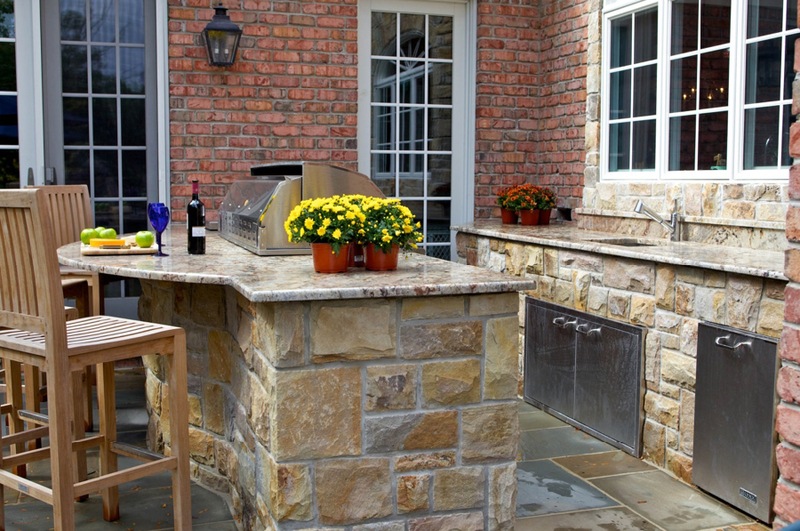 An outdoor kitchen allows you to cook a meal with friends and family without being holed up in the kitchen and missing out on the good conversation. Not to mention all the sunrays and good weather. Use concrete pavers to build the worktop and frame of your outdoor kitchen. 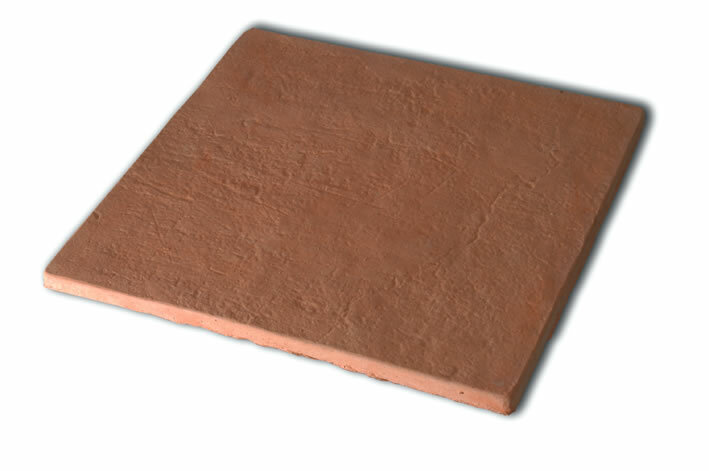 Paving stones can be used to create an attractive paving area around the outdoor kitchen. The equipment that you will need for your outdoor kitchen includes most braai type appliances but ensure they are all stainless steel to ensure durability. Stainless steel appliances require far less maintenance and won’t need painting or sealing to ensure longevity. Create a cupboard for easy storage by installing stainless steel cabinet boxes below the worktop surface. 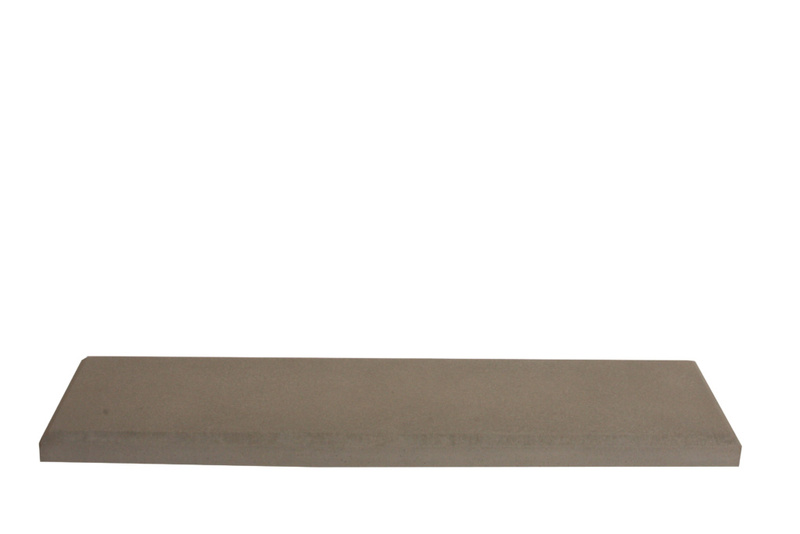 Complete the process by attaching stainless steel cabinet doors to the flanges of the stainless steel cabinet boxes. An outdoor kitchen cupboard is a great place to store plates, utensils and braai equipment. If you’re feeling ultra-fancy, install a small bar fridge to keep your coolers cool and your drinks crisp and fresh. Do you live in a warm climate? An outdoor hangout area is a perfect excuse to spend your days outdoors and not in front of a screen. Choose an area in your garden and then use concrete pavers to define the area. You can even use concrete pavers to make benches and other seating options which you can soften and beautify with outdoor or patio cushions. 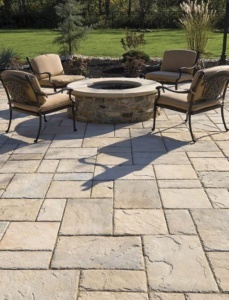 For chillier nights, you can install a fire pit for all your friends and family to gather around and enjoy each other’s company. Go from summer to winter with your cosy hangout, swopping bikinis for beanies. The beauty of an outdoor hangout area is that it moves with your activities. Whether you are braaing marshmallows or sipping cool lemonade on a hot day, a hangout area in your garden allows you to make the most of all seasons. Choose attractive paving stones to complete your area or even just stick with concrete pavers for an all-round unified look. Who says you have to have the same shaped concrete pavers or paving stones? 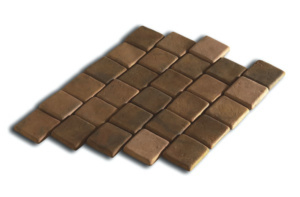 Choose mismatched concrete pavers that needn’t necessarily provide a function, rather an aesthetic appeal. Concrete pavers have a natural quality of tying an area together and providing dimension to an otherwise bland space. This visual interest can make an area appear larger (much like a mirror does for a small room). A mixture of mismatched paving stones and concrete pavers are also able to link one area of your outdoor area to another. You may have created two or more areas in your garden that you are proud of. 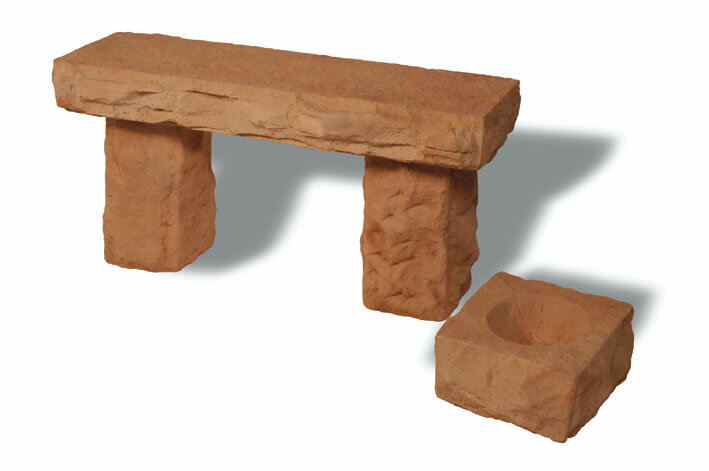 This may be a water feature or raised garden, hang out area, outdoor shower or outdoor kitchen. Having paving stones as a visual feature contrasts all areas yet somehow unifies the entire space, much like an accent piece. You can also create further contrast by mixing paving stones and concrete pavers in a woven and perfectly designed culmination of colours, gradient, and contrast. If you were paving a circular area, this can be achieved by selecting a neutral colour paver and then defining it with a darker or lighter paver to encircle the inner paver. So there you have it: pavers aren’t simply pavers and meant for a single use. Pavers provide dimension, contrast, functionality and a visual interest that enables endless options when redesigning your outdoor space. 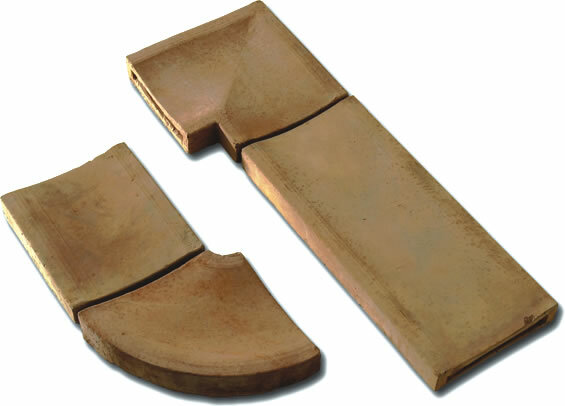 For more on our traditional and engineered range of concrete pavers, click here. Click here to take a look at some of the most recent projects that we are most proud of.